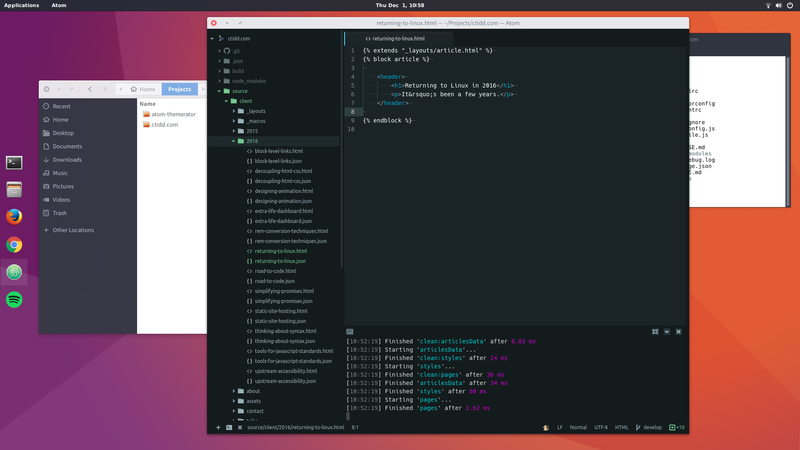 Ubuntu with GNOME 3 and the Arc GTK+ theme. I used to be an avid Linux user. Several years ago, I switched away, and I’ve been bouncing between platforms since then. At some point, I lost touch with the Linux ecosystem and I stopped keeping up with the latest changes to GNOME, Unity, and KDE. When I decided to build a new desktop and give Linux renewed consideration as my operating system of choice, I was expecting a certain level of effort that used to be involved with getting things dialed in. Even after that, it would be worth a bit of UI inconsistency in the name of using free software and avoiding lock-in. Right now, I’m happy to say I didn’t get what I expected. My system ran flawlessly with a fresh installation of Ubuntu. After getting a few essential applications up and running, I did choose to install GNOME 3 with a custom theme and tweak some settings and extensions. The ability to change these things to better suit my preferences is a fantastic option to have, and it’s not at all necessary for most users. Making the desired changes, I was pleasantly surprised by how straightforward the configuration process was, and how cohesive the result is. In 2016, Linux is more than capable of providing a polished desktop experience — thanks to an innumerable community of contributors and their continuous efforts to make things better across the ecosystem. No Topleft Hot Corner: GNOME has a hot corner without a built-in option to disable it. This extension saves the day and disables the top left hot corner. Dash to Dock: By default, the GNOME application dock isn’t visible without entering the dash view. This extension makes its behaviour more similar to the OS X dock.